Egg salad reminds me of the lunches I brought to grammar school on Fridays during Lent, and I tend to remember them as mushy and bland. But when I was staring into my rather empty refrigerator on a snowy day, I decided that was the best option for lunch. I used yogurt instead of mayonnaise to save calories, and served the egg salad on toast so the sandwich would have more texture. I think I’ll be eating these more often in the future! 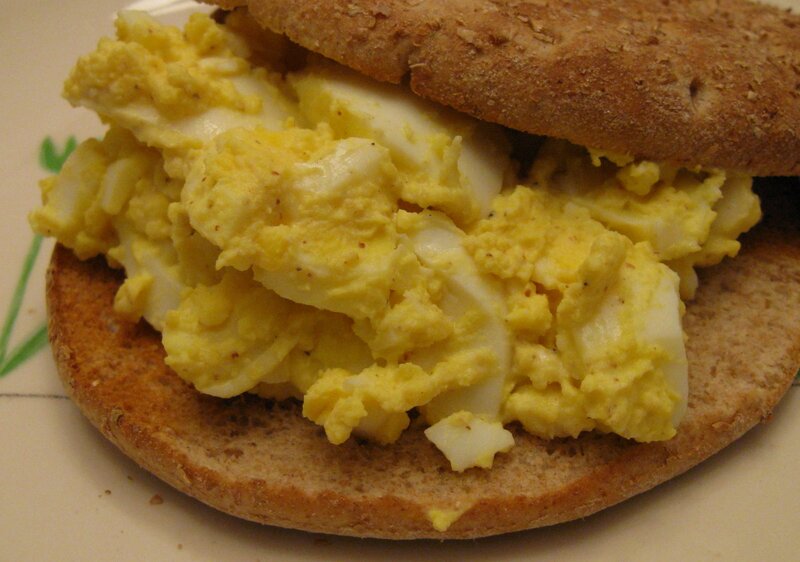 Makes enough egg salad for 2 sandwiches. There are a lot of theories out there on how to make the perfect hard boiled eggs. My method is to place the eggs in cold water, and cook on the stove top until the water comes to a boil. Allow the eggs to boil for 1 minute. Remove from heat, cover for 10 minutes, and rinse with cold water. Peel and slice the eggs, and mash slightly with a fork. Add in mustard and yogurt, and salt and pepper to taste. Yum, looks like that is on an Arnold Sandwich thin too!